This obviously wouldn’t be newsworthy in United States or other countries with highly militarized police forces. American officers routinely carry pistols and, if TV shows like Cops are any indication, are willing to get them out at every opportunity. Down here, the police don’t carry firearms and the use of the Armed Offenders Squad is relatively rare. I think this is a major factor in the general professionalism and reasonableness of New Zealand cops. While there are bound to be a few sociopaths in any police force, police brutality and arrogance seem much less common here than in the States. To my knowledge, no reliable measures of police misconduct exist, but I don’t think this is just denominator-blindness: pointing guns at, tasing, pepper-spraying, or handcuffing people not posing any immediate threat seems to be common practice in the US, but is very rare here. A bunch of normal young guys were randomly assigned to be either prisoners or guards in a mock prison. The experiment was due to run for a week, but had to be called off early after the guards became increasingly cruel – with situations eerily similar to those in Abu Ghraib – and the prisoners increasingly accepted the dominance of the guards. Normal people became either sociopaths or cowering messes depending simply on the roles they were assigned. There are frequent calls to arm the New Zealand police, especially after an officer is killed or injured on the job, and the use of tasers is becoming more common. Needless to say, I think this is a very bad idea. Arming the police might make them slightly more capable of fighting genuine crime, but it’s almost certain to make them into a group to be feared by innocent New Zealanders. Opposition to an armed police force isn’t based on nostalgia, as some would claim, but an understanding of human psychology. Citizens should not be afraid of their police, and police should definitely not be pointing guns at citizens without a very good reason for doing so. Yes, even there, you know, what comes out of that is the guilt or innocence of each of the leaders. So tribunals say, “We have the power to put leaders on trial, even though they in fact—none of them actually killed anybody—it’s just they created a policy, they created a system.” But I would hope they would go to the next level and make explicit: “In punishing this person we are really publicly declaring that this ideology produced the crimes against humanity. And so we, as an international body of humanists, of jurists, decry the horrors of this kind of system.” So you’re really sending out a message: it’s the system that’s wrong, and these people helped create it. Hitler helped create it, and Pol Pot.… But once it’s created, once the Stanford Prison Experiment was created, I’m irrelevant. If I had died during the thing, it would have gone on. The guards would have been happier. If Hitler had been killed, the whole thing would have gone on only because it had already corrupted the legal system, the educational system, the business system. With all these mechanisms in place, he became irrelevant. In fact, he would have been a big martyr. There’s also a lot of talk about the implications of Zimbardo’s situational theory of evil for moral responsibility, how Zimbardo was sucked into the situation and became evil himself, and the war on terror. Read the whole thing, especially if you enjoy despair. Being drunk in a public place should be an infringement offence that incurs a fine, Sir Geoffrey said. 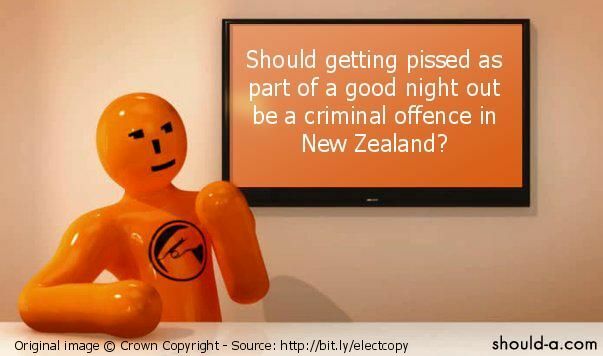 The amount of police resources used policing the “late night culture” in New Zealand was “truly astonishing”, he said. This guy is clearly a puritan; he doesn’t like drinking and feels the need to Do Something about it. He’s willing to cite whatever shonky research best serves his case. As it happens, I don’t think government should be concerned with reducing the social costs of alcohol: I think they are much smaller than the social costs of any policy intervention I can imagine. Even if we accept the need to Do Something, however, Palmer’s proposal worries me more than other (perhaps less efficient) means of alcohol control. Since being drunk is arbitrary, the proposal would give police more arbitrary power. As someone who takes the rule of law seriously, this worries me more than the (very high) cost of excise taxes on innocent drinkers. Unless you think being drunk is itself wrong, in which case I don’t much value your opinion, this gives cops another legal weapon to brandish against innocent people they don’t quite like the look of. Discretionary power sounds reasonable enough, but it is dangerous. It replaces the rule of law with the rule of men, and history teaches us that power corrupts.